If you are looking for a birthday present, holiday gift or a fun travel memorabilia check out our recommended Top 10 Tokyo Toy Stores. Although you can buy almost all of the toys on the market from Amazon.co.jp, there is still something fun about checking out the latest and greatest in person at a brick and mortar store. 1. Hakuhinkan (Ginza, NishiShinjuku & Narita, Haneda and Chitose Airports) – I think the Hakuhinkan Toy Store is the best toy store in Tokyo to shop for your kids or any kid in your life. Hakuhinkan has four floors jammed packed with wacky Japanese toys, gag and costume items. From traditional and educational toys to the world famous brands from Brio to Barbie. Highly recommend making it a stop on a tour of the Ginza area. When you visit take the elevator in the back of the Ground Floor up to the 4th floor and wide your way down. The circular staircase is a bit hard to maneuver going up with little ones. I was very impressed with their stuffed animal and doll areas, the science and educational toys selections and building toys including Tomica, Brio and Lego. Ginza Store Access: 5 min walk from Shinbashi station (Exit 1) on the Yamanote line or Ginza Line, 8 min walk from Shiodome station (Exit 3) on the Oedo line or 10 min walk from Ginza station (A2). 2. KIDDY LAND (Omotesando/Harajuku) – Conveniently located on Omotesando Dori you can spend hours checkout the five floors of character goods, dolls and construction toys. Kiddy Land has been in business for over 60 years and continues to thrill both domestic and international children. There is an elevator for strollers but it is incredible crowded and takes forever. We recommend you leave the stroller on the 1st floor and use the stairs. They also have a store in Odaiba Venus Port 2nd floor and in Umeda, Osaka. The store has free Wifi (Kiddy Wifi) and is Tax Free for international travelers. 3. Yamashiroya (Ueno) – Yamashiroya is six floors of toys, figures, games and pro-models. The store offers all the top Japanese brands with an impressive selection of pro models and anime characters. There are also huge selections of Starwars product, Lego, and Barbie. The store is very crowded on weekends so if you do plan to visit I recommend early in the morning. There is an elevator, but I recommend leaving strollers outside since the aisles are very crowded wth merchandise. Highly recommend for holiday and birthday shopping, you will not leave empty-handed. the widest selection of pregnancy and baby items in Japan. You can find most Japanese and foreign baby gear brands across strollers, car seats, toys and feeding accessories. They have an good selection of toys for babies and toddlers. Akachan Honpo also a selection of maternity clothing and accessories. 5. BIC Camera (Ikebukuro, Yurakucho, Shinjuku, Shibuya and over 40 other locations across Japan) – BIC Camera is a huge electronics chain store with about 40 locations throughout Japan. They sell everything from home electronics to car navigation systems, washer dryers to iPhones, Beauty and Health products to PCs and Printers, and little known to most – toys. Their toy section is filled with famous brands like Takara Tomy, Bandai, Mattel, People, Kumon, Lego and more. Enjoy browsing through the Japanese educational toys from Kumon and People or building toys like Tomica, Nano blocks, and Lego. Kamen rider action figures, Tomica cars and trains, Pla-rail, and trading cards are popular with boys. Parlor beads, dolls (Meru, Lica, Barbie and the Sylvanian Family) and crafting are popular with girls. 3D doodling pens are also a crowd pleaser. One of our favorite gifts to give friends are the Japanese Shinkansen / Bullet train designed utensils and chopsticks (less than 500 yen each). Stop into the BIC Camera closest to you. 6. 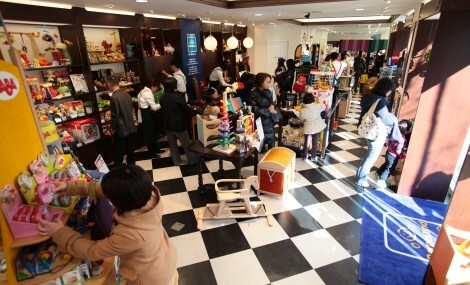 Bornelund (Daikanyama, Roppongi Hills and 20 other locations in Japan) – Beautiful higher end wooden and edutiaonal toys. Very knowledgeable staff that can help you with age specific recommendations. Most of the stores has touch an play areas where your children can try out many of the toys for sale. 7. Toys “R” Us and Babies “R” Us (Odaiba & over 50 other locations) – This mega box retailer has a huge selection of mass maker import and domestic toys. Odaiba has parking and is conveniently located to the train. They also have a Japan commerce site which offers free shipping over 5,000 yen. You can see this 360 view of their Odaiba Store. 10. Character Street (Tokyo Station) – Under Tokyo Station is the Character Street which has around 15 stores selling Doraemon to Hello Kitty. Character Street is in the basement on the Yaesu side of Tokyo Station. Great place to pick up some plush character, key chairs, cookies and other knick-knacks that are just too cute (Kawaii)! BONUS: Hamleys Yokohama City. Hamley`s opened their first store in Japan with Bandai Namco Amusement and features entertainers, playground attractions including merry-go-rounds, games corners and infant play spaces. Explore 2 floors of toys UK and Japan branded toys and entertainment.